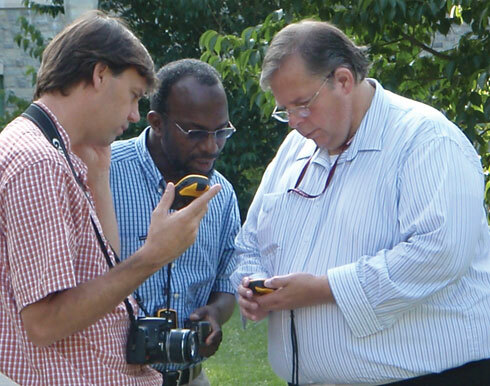 Associate Professor John McGee (left) shows participants how to use a handheld GPS unit during a workshop for educators presented through the Geospatial Technician Education Through Virginia’s Community Colleges project. BLACKSBURG, Va., Aug. 30, 2010 – The Virginia Geospatial Extension Program, based in Virginia Tech’s College of Natural Resources and Environment, has teamed with the Virginia Community College System (VCCS) and the Virginia Space Grant Consortium to develop a geospatial Web portal that will help train the future generation of geospatial technicians in Virginia. Geospatial technology is a broad term referring to geographical information systems (GIS), global positioning systems (GPS), and remote sensing, and the emerging technologies and applications that support the collection, analysis, and interpretation of spatial data. This rapidly growing field, however, it is limited by the number of trained geospatial technicians. The VCCS Geospatial Portal will support the Virginia Community College System’s efforts to train geospatial technicians to meet industry demand for skilled workers. This website, which is a repository for geospatial technology pathway models, curriculum, professional development materials, and other resources, serves as a gateway for VCCS faculty and students and others interested in supporting the development of a geospatially literate workforce in Virginia. The portal is part of the Geospatial Technician Education Through Virginia’s Community Colleges project, which includes educational materials development, adaptation, and implementation, and provides professional development and mentoring for faculty and high school teachers. The curriculum and certificate programs developed through the project will be driven by the needs of business and industry in the commonwealth. “The VCCS Geospatial Portal will help the community colleges market their geographic information systems courses and work more efficiently together, and will provide students with immediate access to geospatial courses, certificate programs, and other academic options available through VCCS member institutions.” explained John McGee, associate professor and geospatial Extension specialist in Virginia Tech’s Department of Forest Resources and Environmental Conservation. The VCCS Geospatial Portal, which is closely affiliated with the National GeoTech Center based in Corpus Christi, Texas, was developed by Blacksburg Electronic Village using Drupal, an opensource content management system. Virginia Western, Tidewater, and John Tyler community colleges; the Virginia Geospatial Extension Program; and the Virginia Space Grant Consortium partnered on the portal’s design and development.